Last week was a pantry-organizing, cobweb dusting, and office cleaning kind of week. This time of year has me rearranging things for a fresh perspective - this blog even has a new shine! I usually avoid obsessing over blog analytics, but after having a good look at them last week, I realized that more than half of you view Sprinkle Bakes on a mobile device. I'm happy to report that the site is now optimized for mobile viewing! You'll also find better share buttons and a new recipe printing format. I love it, and I hope you will too! Easter is this Sunday, and I've got the happiest springtime recipe that takes just minutes to make. This is something that little hands can help with, too. All you need is a package of white almond bark, a bag of colorful candy coating and your favorite Easter candy. 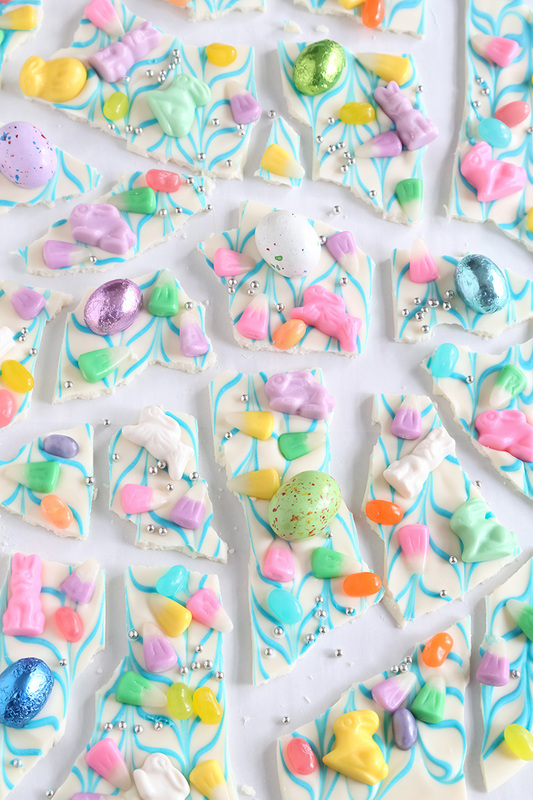 It's fun to mix and match your favorite Easter treats for this recipe, or you can do as I do, and use Jelly Belly's Deluxe Easter Candy Mix. It has the perfect ratio of bunnies to chicks, malted milk eggs to chocolate foil eggs, and jelly beans to pastel candy corn. I found the candy at my local grocery store, but I suspect you can find it wherever bulk candy is sold. Almond bark can be found at grocery stores in the baking aisle, usually next to the chocolate chips. If you're having trouble finding it, look for packages labeled as "White Candy Coating". 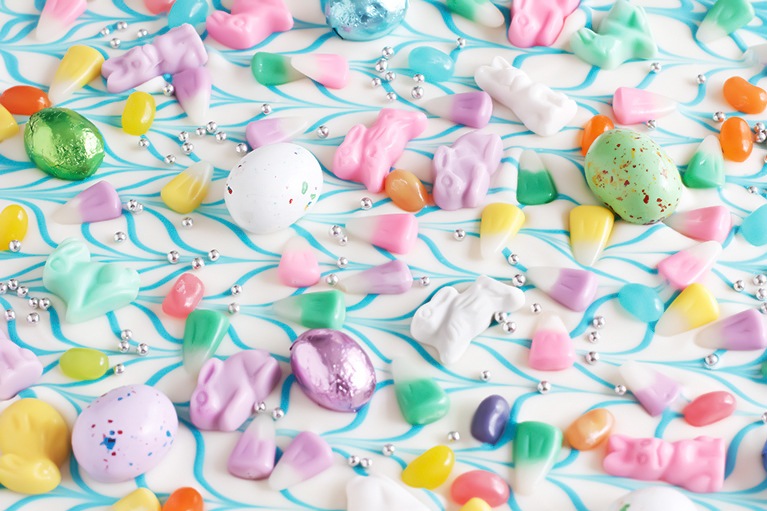 The colorful candy melts can be found at most craft stores. I used the Sky Blue candy wafers that Angie (a.k.a. Bakerella) sent me from her new Make'n Mold line - so fun! You can find those at AC Moore, or order them here. Cover a work surface with sheets of parchment paper. In a microwave-safe bowl, melt the almond bark at 30 second intervals in the microwave until the candy can be stirred smooth (about 1 minute 30 seconds). In a separate bowl, microwave the sky blue candy wafers until they are melted and can be stirred smooth. 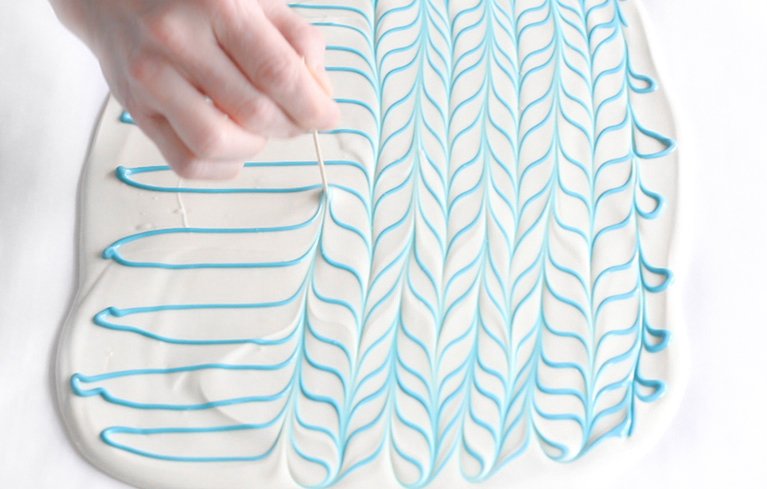 Transfer the blue melted candy to a disposable piping bag. You may use a plastic zip-top bag if you don’t have a disposable piping bag. Quickly spread the almond bark on the parchment paper into a rectangle about 15x11-inches. Snip a small hole in the tip of the piping bag and pipe lines of blue candy across the white almond bark. Drag a toothpick through the blue candy lines to marble the bark. Quickly sprinkle on the assorted Easter candies and silver dragees, if using. Allow the candy to stand at room temperature until set, about 30 minutes. Lift the sheet of candy from the parchment paper and break it into pieces. Store the candy in an air-tight container, or place it in cellophane bags tied with pretty ribbon for an Easter basket goodie. Note: I use foil-covered chocolate eggs on this candy because they are so pretty and nostalgic. These chocolates must be unwrapped before eating. Just pop them off the surface of the candy, unwrap and enjoy! So cute..love the little bunnies. I LOVE this! It's so incredibly perfect for Easter but I don't think I can wait that long to make it! This is absolutely the prettiest bark I've seen! Love it! Wow love that colourful-yummy mess! Too easy, Heather, which means most of it would never get out of the kitchen at my house! Ah! I finally made it to the actual blog post and see my FB questions were already answered. I'm sorry I was slow on that...I was mesmerized by the video! Thank you for this ah-dorbz idea! this is the most AMAZING bark i have ever seen created...you are AMAZING!!!! SO festive! I love it! This is too stinking cute! !